Is Hahn Turning into another Luebeck? Last Monday, Rhineland-Palatinate State officials patted themselves on the shoulder after having finalized a complicated deal: the sale of their loss-making airport Frankfurt-Hahn to a Chinese bidder. Meanwhile, euphoria is gone and disillusionment prevails. 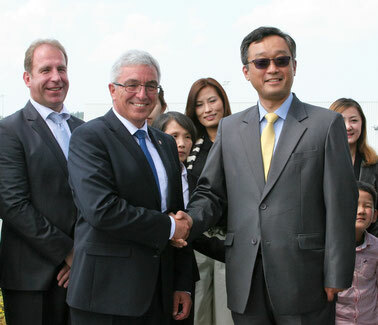 Critics fear that Hahn could become another failed Chinese takeover of a regional German airport. Members of R-P’s government presented at a long-awaited press conference last Monday (6 June) the Chinese investor Shanghai Yiqian Trading Co. Ltd (SYT) as winner of the yearlong tender. That day, everybody attending the briefing thought, that Hahn’s future would be safe, without the need to be subsidized any longer by tax payers. However, only 5 days later, doubts are outweighing the optimistic expectations, shedding pale light on the deal. Right after the pact was inked, many raised the question who Yu Tao Chou really is and on whose behalf he is acting, since not much is known about him and his company. All that can be confirmed at this stage is that he acts as SYD’s chief representative vested with decision-making powers and that Chou was a former pilot flying for all-cargo carrier Yangtze River Express. That’s about it. Shortly after signing the Hahn contract, first doubts came up about Chou’s origin. Some claim he is a Chinese national, other sources say he has a Taiwanese passport. No word from him on that. In contrast, he presented big plans to revitalize Hahn as a hot spot for cargo and distribution center for consumer goods flown in from China. In addition, he announced the return of carrier Yangtze River Express by transiting their operation from MUC back to HHN. Asked if Yangtze intends taking this step, their Marketing Manager Wang Bo denied any such plans. “The customer demand declined, that’s why we left Hahn and switched our traffic over to Munich instead,” he explains. Wang Bo added to this that he never heard of a mister Yu Tao Chou or his enterprise Shanghai Yiqian Trading. Yangtze River Express was Hahn’s largest client, accounting for about 30 percent of the airport’s cargo throughput. After swapping their traffic from HHN to MUC in mid-2015, the tonnage at Hahn declined massively. This all reminds very much on the fate of Luebeck Airport located close to the Baltic Sea in Northern Germany. In 2014, Chinese national Chen Yongqiang, owner of a company named PuRen, took over the airport. He announced to turn the place into a huge training center for young Chinese pilots. Yongquang spoke of 5,000 student pilots he’d bring to Luebeck each consecutive year to achieve a private pilot license there. This would need well over hundred training aircraft, many instructors and technical personnel. In September of 2015, Luebeck declared itself insolvent. So much to the promises and high-flying plans of Chinese firm PuRen and its boss Chen Yongqiang. Not only Wang Bo has ever heard of a company named Shanghai Yiqian Trading, also his colleague Yu Yang declined knowing the firm. However, Yangtze’s head of staff management confirmed that Chou is standing on the carrier’s payroll. “He continues being one of our pilots,” Yang stated. An active pilot, signing a multi-million airport investment? Very strange. Fact is that SYT is recorded in Shanghai’s trade register since November 4, 2013 with an initial capital of 500,000 Yuan (€67,000). Not really a treasure, though. Asked about his firm’s business and financial resources Chou said that SYT is closely cooperating with a construction company named Guo Qing Qin Huang Island, a specialist in airport matters. However, local Shanghai sources denied knowing this enterprise that even doesn’t have an own website. These irritating and controversial jigsaw pieces make the Hahn-SYT pact very mysterious, to say the least. The key question is, how Chou and his firm or their backers will manage to finance the million euro Hahn commitment in view of their own rather poor monetary resources, measured on SYT’s nominal capital. Did others, whose interests remain in the dark, have pushed him as dummy into the spotlight? Big question mark. It’s the obligation of Rhineland-Palatinate’s politicians to deliver credible answers – the sooner, the better!